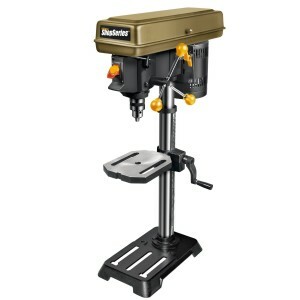 JIANGSU JINFEIDA POWER TOOLS ZJ4116QC 10-Inch Drill Press with laser has rich features. These features are front switch for better operation, 3.6A motor 3/5 HP with 12 speeds from 290 to 2800 rpm spindle speed. The table size is 7-9/10-inch by 7-3/5-inch, the base size is 14-inch by 9-1/5-inch. Jiangsu drill press has 45° left and right table bevel. 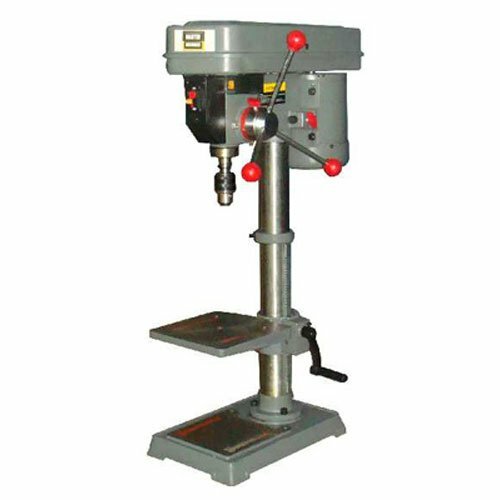 JIANGSU JINFEIDA POWER TOOLS ZJ4116QC 10-Inch Drill Press is durable and has numerous features for all your convenient drilling needs. SKIL 3320-01 3.2 Amp 10-Inch Drill Press features 0.5 inch keyed chuck, 5 speeds (570 to 3,050 rpm), adjustable depth slot for accuracy and frequent drilling, 0 to 45° left right tilting work surface and laser X2 2-beam laser for precise hole alignment. SKIL 3320-01 3.2 Amp 10-Inch Drill Press provides needed support with superior power. This is really a great drilling machine for accurate and fast drilling requirements. Craftsman 10 in Bench Drill Press comes with laser trac and it is a durable drill press that delivers smooth operation because of the powerful motor it has. It features 5-speed settings, 0.5-inch keyed chunk and it has Pinion table elevation system for a quick and convenient adjustments. The motor profile is 6.0 Amp, 120 V, 60 Hz. Craftsman 10 in Bench Drill Press is made in a way so that you can achieve accurate settings. 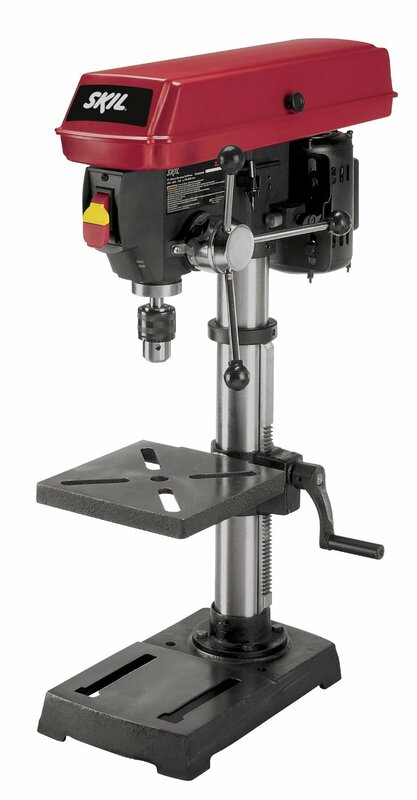 10 Inches Rockwell RK7033 Shop Series Drill Press Replaces RK7032 Drill Press can be a perfect tool to your home workshop. It features a powerful 6.2 Amp, 2/3 HP motor, 5-speed gear box that result in desired performance. Moreover, it is very convenient because of 45° left and right bevel with 2-inch spindle travel. It also comes with an easy rack and pinion table height adjustment. Keeping undesired starting, it comes with a keyed safety switch to stop the accidental starting. 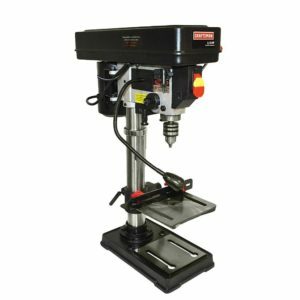 If you want to purchase a drill press for your home workshop, you can check this Rockwell RK7033 drill press (shop series) that carries advanced features and the price is lower than other drill presses from the different brands if you compare the features. Rockwell RK7033 features heavy duty 6.2 AMP motor (2/3 HP), 5 speed gear box that offer smooth performance. Keeping handiness in mind, Rockwell has used 45° bevel (right and left) with a 2” spindle travel that make drilling very easy. It has great adjustment feature for rack and pinion table height adjustment. For repetition, precision, Rockwell RK7033 delivers great result as it handles any types of materials such as plastic, metal, wood and others. I will say Rockwell RK7033 Shop Series drill press (10-inch) can be a great addition to your home workshop without spending too much money. With this purchase, you also get important accessories such as allen wrench, chuck key and other tools. SKIL 3320-01 Drill Press features 3.2 AMP motor, LaserX2, 2 Beam laser system, 0° to 45° L & R tilting work surface, 5-speed (570 to 3050 RPM) and depth adjustment system. The work table is made of cast iron that is good for durability, consistency and accuracy. SKIL 3320-01 is made in red color that looks good at your workplace. Keeping consistency in mind, it features depth adjustment system that is good to drill down consistently all the times. SKIL 3320 can handle any materials such as iron, wood and other hard materials. It can be used for your woodworking requirements as it is good to work with larger diameter bits for all your efficient and precise woodworking requirements. Of course, it is solid enough to handle heavy duty tasks and to maintain the consistency. Most importantly, it has gotten certification from cSAus means all the parts have been approved from the cSAus institution to make sure it use using only high grade components and it is safe to use at workplace.